Description: Each case contains 72 bags of onion rings. Each foil bag contains ½ ounce of product. Serving Suggestions: Crush a bag of onion rings and use as a topping on a casserole or salad. Serve as a snack for lunches or picnics. Ingredients: Modified corn starch, tapioca starch, vegetable oil (may contain one or more of the following: corn, cottonseed, soybean, sunflower, or canola oil), onion powder, potato flour, salt, sugar, torula yeast, hydrolyzed torula yeast proteins, hydrolyzed brewers yeast proteins, monosodium glutamate (flavor enhancer), garlic powder, paprika, spice extractive flavorings, yellow #5, yellow #6, red #3, blue #1. From Anonymous of Zolfo Springs, Florida on 8/29/2007 . From Jeff Lofton of Birmingham, Alabama on 7/18/2007 . From Anonymous of Indianapolis, Indiana on 2/27/2007 . From Happy Customer of Weston, Massachusetts on 9/29/2005 . From Anonymous of Denver, Colorado on 2/11/2005 . 10/7/2006 – Would it be possible to include 1 sample package in my order of these onion rings? I would to know if my son Reid (MSUD) . . .
8/8/2006 – Do you ship these internationally ? 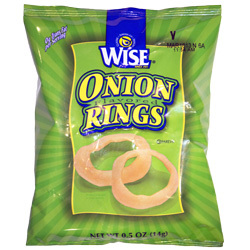 5/4/2006 – I live in Lancaster,texas near dallas texas and i would like to know where can i find wise onion rings. i love them i'm just . . .